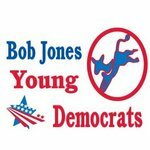 Welcome to the official page for the Bob Jones High School Young Democrats club, informing about club activities and Democrat party affiliations as well. As the BJHS Young Democrats Club, we are a chapter of the High School Democrats of America, which is a nationwide organization for high school students that are actively involved with the Democratic Party. We are a group of STUDENTS who are committed to representing our party at the local, state, and nation level and increasing the involvement of students in these political fields. We actively participate in campaigns to elect Democratic candidates to public office at all levels of government, advocate for issues and reforms vital to bettering and expanding our democracy, discuss political issues that affect us as both students and Americans, educate people about the Democratic Party, as well as spread Democratic opinions and ideals with the world.